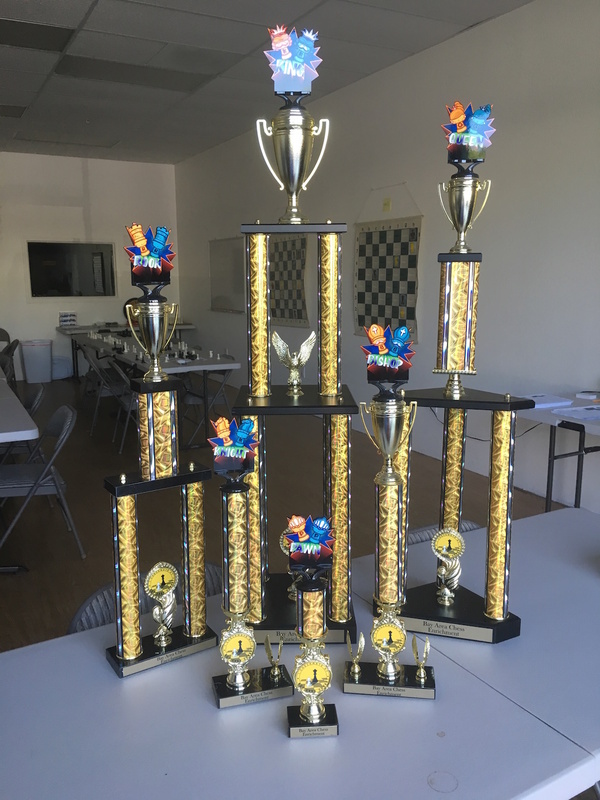 We at BayAreaChess believe that a range of rewards is an integral part of the promotion of good values and chess excellence. Merely winning chess games is not the basis for broadening a child’s knowledge, developing a stronger player, or mastering chess itself. We have a simple system, therefore, that rewards students—from novice to Expert-- regardless of their individual skill level. We are inspired when our students challenge themselves, making their best effort, demonstrating diligence, resilience, and sportsmanship. Our rewards system helps to bring out such qualities in our students, both in the classroom and the tournament hall, as well as in their everyday lives. We use a reward system that confers points, which correspond to a student’s personal efforts, most of which are earned by student participation during in-class activities such as contributing during lessons and other activities, demonstrating good behavior and sportsmanship, and completing homework assignments. Point totals represent various rewards, which we give out at the end of each term. Designed for 4-year participation, the system is such that by the end of the fourth year, ideally every player had a reasonable chance for earning all awards in the line. BAC has developed a new way to keep you better informed about your child's progress in our enrichment programs! The Progress-Report-Card is sent home with students once or twice per semester, allowing for the coach to give comments or recommendations about their progress in class. The student will be also be updated on their total number of class points (which accumulate towards rewards and carry-over every semester). Behavior : Overall attentiveness, respect for the class and coaches, and cooperation with classroom expectations. Participation : In-class enthusiasm, attendance, sportsmanship and willingness to learn. Scores are delivered on a 5-point scale (1-5), with 3's being considered 'on-track'. Regardless of the formula by which the coach chooses to assign scores, a score of a 3 is always considered a decent 'grade', and by no means debases their performance. Scores of 4 and 5 are intentionally rare. 1. Improves math and reading skills. 2 .Boosts memory and retention. 3. Cultivates problem solving ability, analytical skills and critical thinking. 4 .Increases visualization and imagination capability. 5. Rewards patience and persistence. 6. Teaches good sportsmanship in a group environment.